Windows Repair Toolbox includes most third-party applications and Windows utilities you might need to repair any Windows problems in one small application. Video tutorial and portable version are available. It’s broken down into categories for Tools, Malware Removal, Tests, Notes, and Settings. When required, the program will download what it needs and can also optionally run many tools in unattended mode. Of course, you can download any of these tools individually or another similar ISO based third-party program, but those are only as good as their updates. Since this downloads directly from the homepage, you always have the latest version and only what you need. Even though you run just a handful of applications on your computer, you can notice how the performance continually decreases over time due to normal system use. Then again, you should not fret, as getting your computer to run like new again is not difficult, particularly if you have the right utility to lend you a hand. 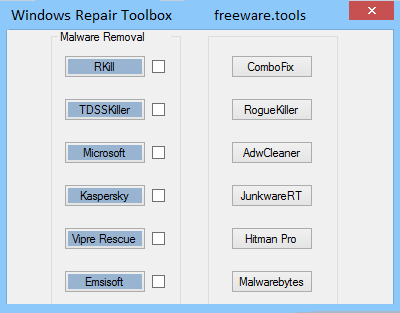 Windows Repair Toolbox is a light piece of software that enables you to download and use known third-party applications to repair your OS and hence, make it run faster and smoother. The program comes with a clean and well-structured interface that consists of multiple tabs featuring different functions that can repair, clean, test and improve the performance of your operating system. The main window enables you to preview and select the tool that can diagnose or correct processes, recover lost data, create backups or safely uninstall programs. Despite the fact that they are neatly organized in categories, the app could have used a better function to provide more details about the software solutions that you are about to download and install. It is important to note that the applications you use via this tool are still bound to their respective licenses. The Final Tests is a further noteworthy tab, as it enables you to verify the files' integrity and overall functionality of components and applications after cleaning and repairing them. Moreover, the app allows you to retrieve the product key for Window as well as email accounts from the Notes tab. Unfortunately, the functions are displayed as very tiny icons, which can make it hard for some users to notice they are even there. Windows Repair Toolbox provides you with a comprehensive bundle of applications that allow you to repair, update, clean and improve the performance of your operating system.